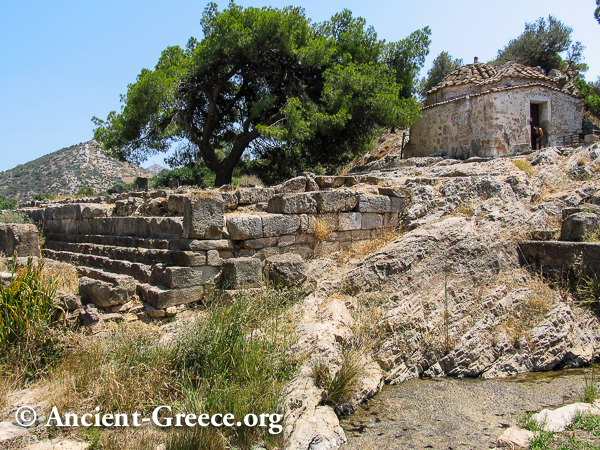 Brauron (Βραυρών, Βραυρώνα, Vravron, Vravrona) is an ancient sanctuary in eastern Attica near Athens. It was dedicated to the Goddess Artemis and it can be related to the Brauronion, which is located on the Acropolis of Athens. 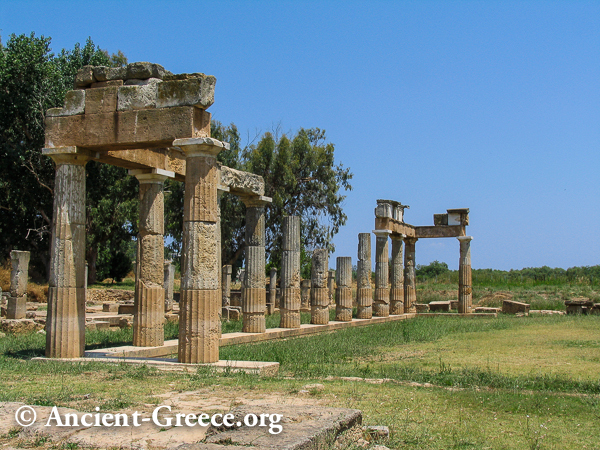 Worship on the site can be dated to the 8th c. BCE, and a temple was built in the 6th c on the site, while most of the major building activity is dated to the late 5th c. BCE. 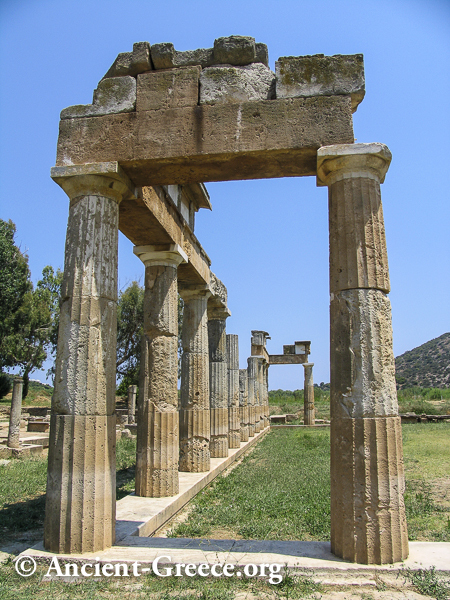 The Π-shaped stoa is the most visible ruin on the site. 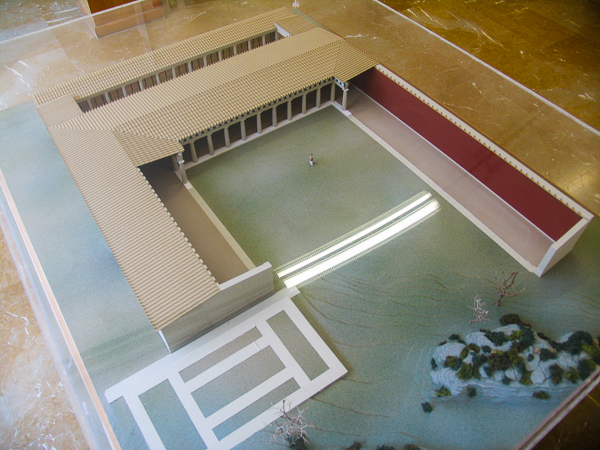 The stoa is of the Doric style and it encloses a central courtyard that's 20x27m. Votive statues were displayed behind the colonnade, of which only the two side columns were completed. 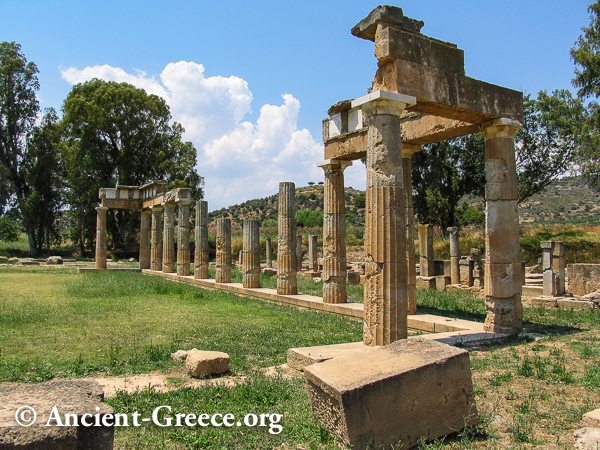 The stoa was built between 425 and 420 BCE, making it the oldest stoa in Greece. 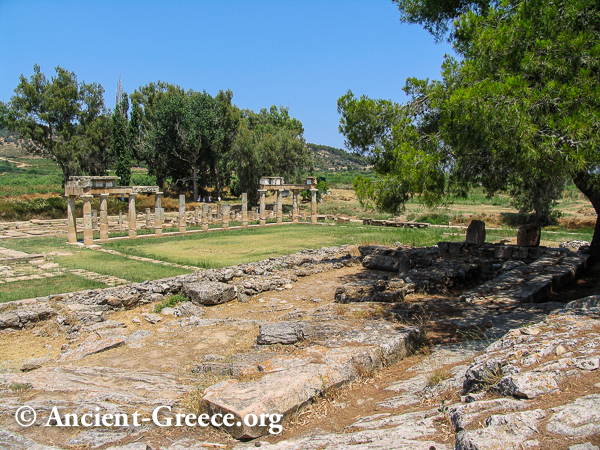 A series of ritual feasting rooms were located behind the stoa colonnade. 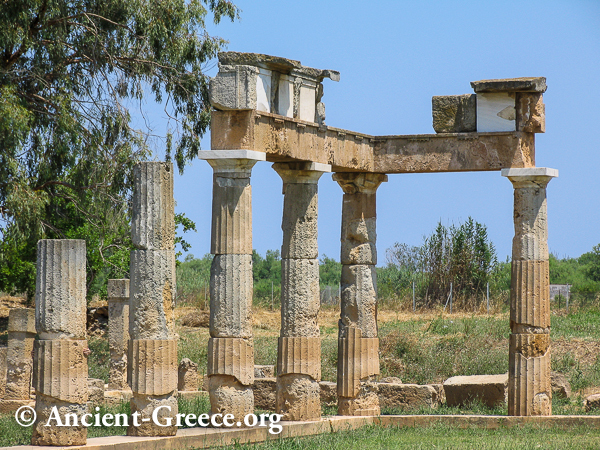 A small church dedicated to St. George (16th c. CE) is located above the foundations of the ancient temple of Artemis. 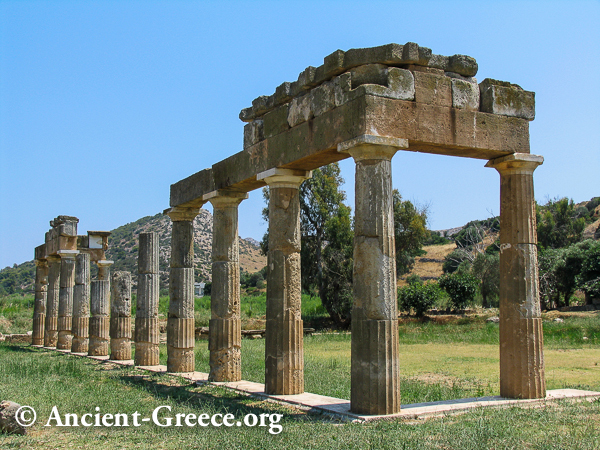 The temple of Artemis was a Doric temple in antis with opisthodromus - adyton, and was built in the 5th c. BCE. 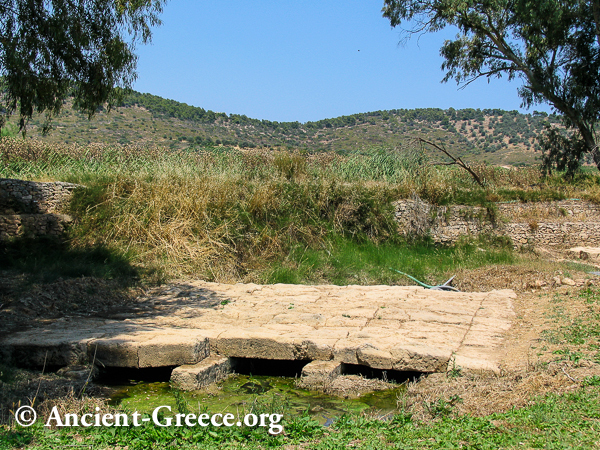 The sacred spring is visible on the lower right of this photo. 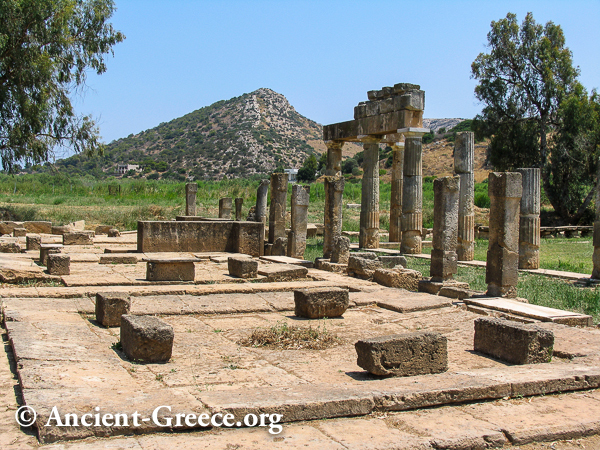 View of the temple of Artemis (foundation blocks in the foreground), the courtyard, and the Π-shaped stoa. 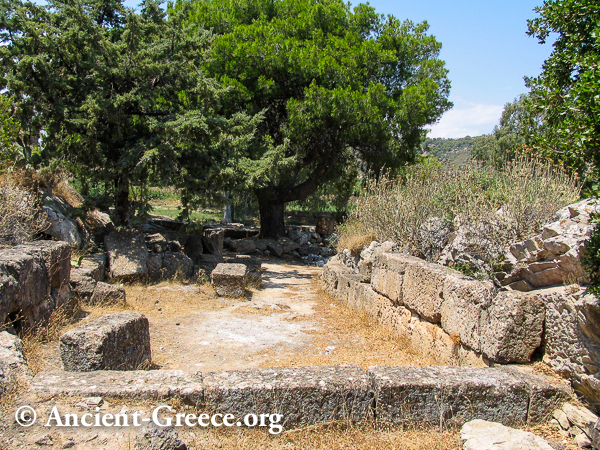 Ruins of a small shrine near the temple of Artemis, probably the Heroon of Iphigenia. A unique example of a classical bridge survives at Brauron. It's 9m wide and bridges the banks of Erasinos river - an 8m long span. The plan on the site is informative. The scale model at the Brauron Museum gives a good idea what the sanctuary of Brauron looked like at its peak. 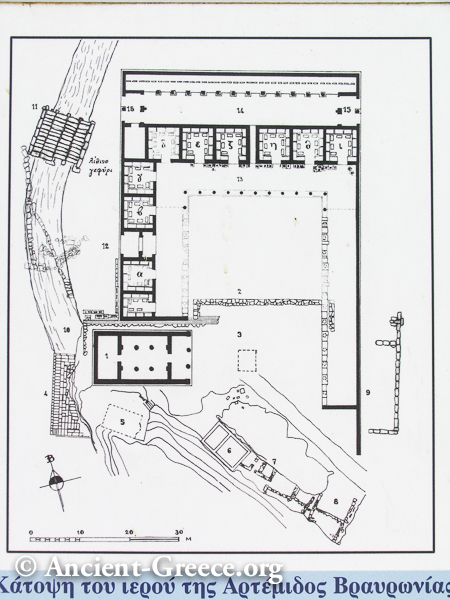 On the left the Π-shaped Stoa, and on the right reconstruction the boarding rooms.